New York — Dan Huttenlocher does not like walls. This is not so much an aesthetic preference as it is a practical concern. Walls divide people and define spaces. They restrict movement. They discourage exchange. And they are a pain to move if your needs change, especially when they are stuffed with cables, ducts and other infrastructure accessories. Mr. Huttenlocher is certain his needs will change. As dean of Cornell Tech, a closely watched collaboration in New York City between Cornell University and the Technion-Israel Institute of Technology, Mr. Huttenlocher is overseeing the creation of an institution dedicated to technological innovation, academic experimentation and the kind of serial flexibility those two principles require. “My goal as the dean is to create an environment where everything can be repurposed,” Mr. Huttenlocher said. He and his team are in the tenuous middle stages of planning and building exactly that: The chameleon campus, a space where interchangeability permeates everything. As Cathy Dove, Cornell Tech’s founding vice president, put it, “We want to embody the principle of iteration. To ask it another way, how do you create a new institution in an age where everything — office design, intelligent infrastructure, cloud computing, classroom technology — presents some opportunity to break with the past? What do you build? What do you wire? What kind of interactions do you encourage? Some institutions might create committees to try to anticipate specific changes. Cornell Tech is determined to do the opposite. Those responsible for building the campus of the future will not pretend to know what the future holds. They only hope they are building something malleable enough to handle it. Cornell and Technion joined forces in December 2011 when New York City officials selected them to build an applied-science graduate school on Manhattan’s Roosevelt Island. The announcement followed an intense and highly publicized competition among the Cornell-Technion partnership and six other higher-education groups, all lured by the city’s offer to donate land and contribute to capital costs. 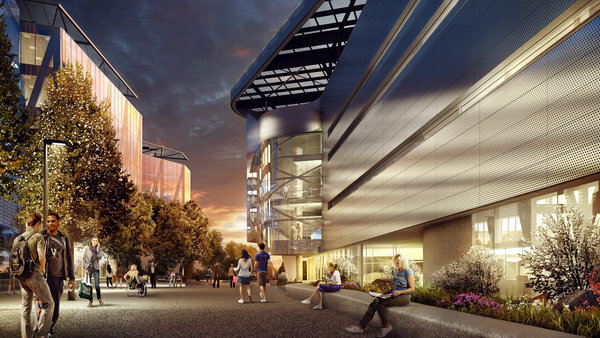 The Cornell-Technion partnership won based on the strength of its coalition and the grandiosity of its plans: two million square feet, 2,000 students, 280 professors, $2 billion. Michael R. Bloomberg, who was then mayor of New York, called it “far and away the boldest and most ambitious” proposal received. Even after winning the competition, Cornell Tech is not easing off its lofty promises. Its website boasts, “We’re creating a campus on Roosevelt Island that’s unlike any ever created in higher education.” At present that campus is a demolition zone containing the carcass of what was once Goldwater Memorial Hospital. But behind the scenes Cornell Tech’s soaring rhetoric is beginning to take the shape of hard commitments. That includes the floor plan for the first academic building, which was finalized two months ago. The second, third and fourth stories of the five-level structure are stunningly undefined, dominated by large, uninterrupted spaces. Classrooms? Faculty offices? The building will have little of the former and none of the latter. Instead there are “office zones,” which will be filled with workstations; those seeking some form of enclosure can enter a “huddle room,” “swing space,” “collab” rooms or a “hub lounge.” The entrepreneurial patois, conspicuous as it sounds, reflects an attempt to break down traditional academic boundaries. The concept is to have a structure where all the building-maintenance functions — such as heating, cooling, ventilation, lighting and fire safety — are fully automated and share data with one another on a common network. For example, the light fixtures in Cornell Tech’s first academic building will have sensors capable of reading room occupancy, and the light-sensor data will feed into an I.T. network that also controls the heating, cooling and scheduling systems. If a room still is not occupied, say, 10 minutes after the time for which it was reserved, the lights will dim, the air-conditioning will shut off, and the room will be reclassified as “available” on a room-scheduling app. The idea of building a campus without a data center was Mr. Huttenlocher’s. He and Mr. Yoest had what the latter called a “heart to heart” about the decision in 2012. The decision has obvious appeal given the quantum leaps in cloud computing, much of it driven by commercial vendors. Why build your own data storage when industry leaders can do the heavy lifting for you? It is a notion that I.T. professionals involved in academics say they have been mulling over for a while. “I guarantee there is no one in higher ed more reliable than Google,” said Sharif Nijim, enterprise application architect at the University of Notre Dame. “You can’t compete with that scale. You can’t compete with that salary paradigm. You’re not going to attract that kind of talent. Take advantage of the fact that other people are landing that talent.” He said that if he could build a campus from scratch today, he would forgo a data center. But the decision comes with risks, especially at an applied-sciences institution where data demands should be higher than at, say, a liberal-arts campus. The embedded assumption is that cloud computing will improve fast enough to accommodate a growing graduate institution. In its embrace of technological progress, the data-center decision encapsulates much of the Cornell Tech mind-set. It also exposes the risk of flirting with what Mr. Huttenlocher calls the “bleeding edge.” In other words, it is great to be at the technological forefront, until the technology does not work.And at present, there is a whole lot of technology that does not work for Cornell Tech. Its temporary campus inside Google’s New York headquarters houses all sorts of experimental playthings. One room has three different videoconferencing systems, setting up a sort of natural selection based on whichever gets the most use. A device called the BeamPro — best described as remote-controlled Segway meets videoconferencing — allows professors to roam the campus hallways virtually even if in reality they are halfway around the world. And classrooms are outfitted with a technology that enables laptops to wirelessly transmit to a common flat-screen television. At least that is what it is supposed to do. “The first round of experiments has been close to a dismal failure,” Mr. Huttenlocher said. In 2015, Cornell Tech will begin testing a prototype classroom to be used in the first academic building. A year after that, the I.T. team will do what Mr. Yoest calls a “deep dive” on audiovisual technology. The gadgetry may be the most immediately appealing part of what Cornell Tech is doing. After all, what would the self-proclaimed campus of “the next century” be without toys? But to make it to the next century with its reputation intact, the institution’s planners will have to avoid investing too much in the kind of proprietary technology that risks becoming quickly outdated. In the meantime, Cornell Tech will keep experimenting, careful not to make too many commitments or erect too many barriers. This summer it will create a new testing ground by turning what is now the capital-planning room into another teaching space. The models and blueprints will move to another office while the existing room joins with the one adjacent to it.